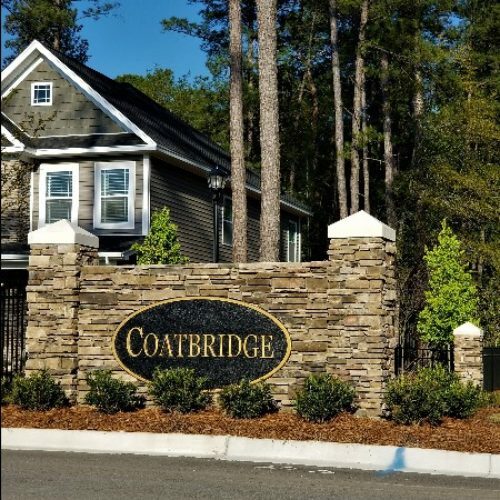 Coatbridge is a 40-acre residential community located just outside the town limits of Blythewood, SC, at the intersection of Rimer Pond Road and Longtown Road, across the street from Blythewood Middle School. Coatbridge residents will have full access to the shared amenity of its sister neighborhood, Sterling Ponds, which is just a short walk away from any homesite. Coatbridge was designed utilizing sustainable, green community developmental concepts known as Low Impact Development (“LID”) Guidelines. The LID approach to site layout reduces storm water impacts and preserves natural drainage systems and open space using bio-retention systems and vegetated swales. Along with being more natural, LID reduces the costs of expensive storm water management structures for municipalities and homeowner associations. Homebuilders within the planned community include DR Horton and Fortress Builders, two of the largest builders in the Central Midlands of South Carolina. Homes are priced from the mid $200’s. Coatbridge is served by the award-winning Richland School District Two and is located within the Roundtop Elementary, Blythewood Middle, and Blythewood High school attendance areas.